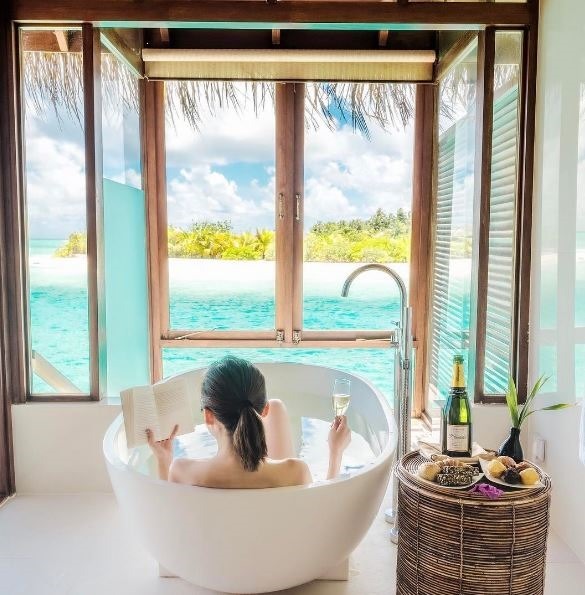 Calgon take me away…to paradise. 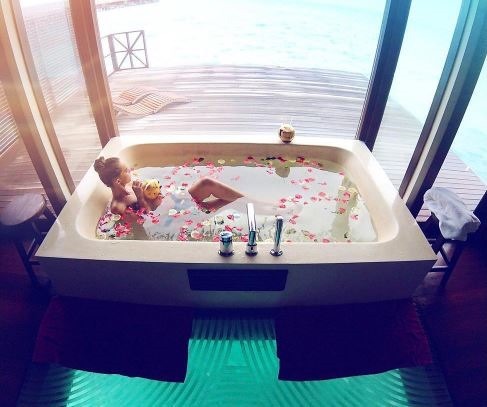 Rub a dub, just relaxin’ in the tub thinkin’ everything was alright. 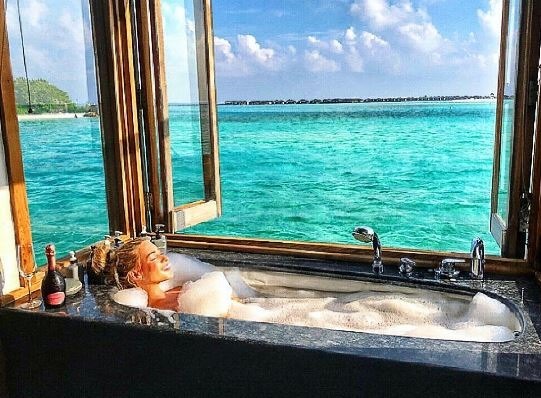 With the warm tropical air and cool ocean breezes, you do as much as possible outside in the Maldives. 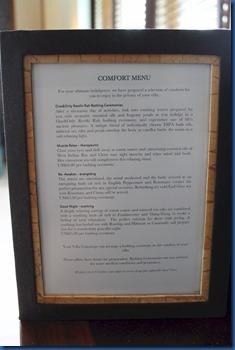 Certainly, al fresco dining every chance you get. 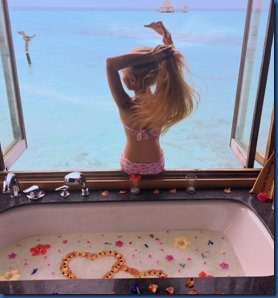 Not to mention, beach versions of every sport there is. 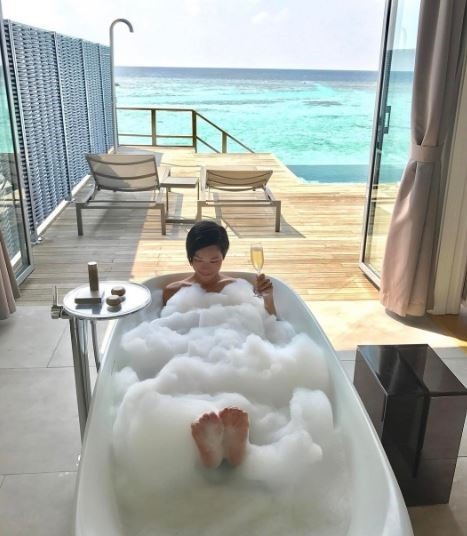 Outdoor showers would probably make a list of Top Ten things you only do (or primarily do) in the Maldives. 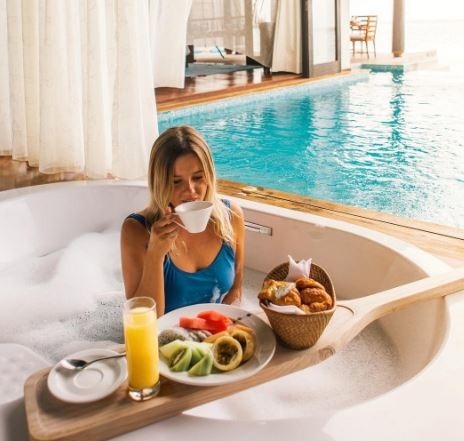 You often will take a couple of refreshing soaks during the day. 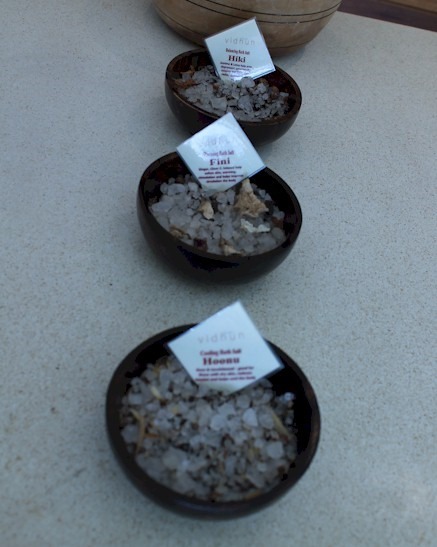 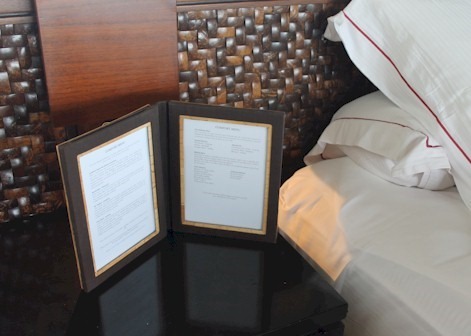 One after your morning dive or snorkel, one after your afternoon in the sun to freshen up for dinner. 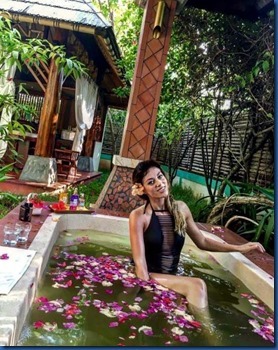 With the glistening water droplets streaming down, it’s also a popular photoshoot Kodak Photo Spot with the fashionista crowd. 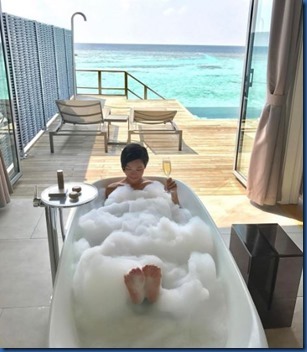 Here is Maldives Complete the not-so-dirty thirty of the shower set. 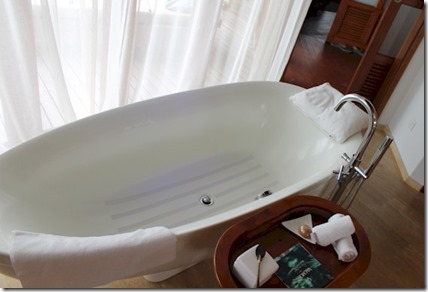 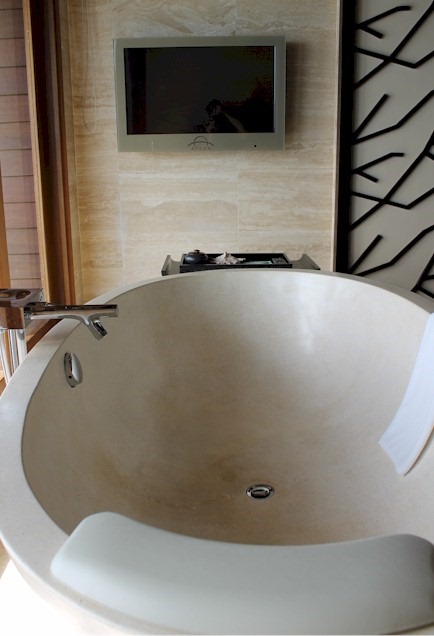 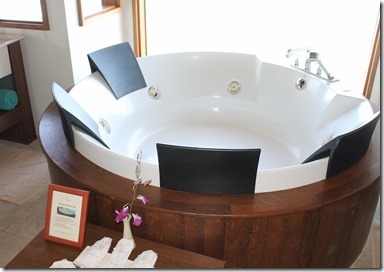 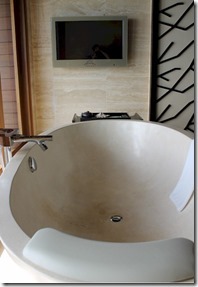 Huvafenfushi has its own bathing with multiple heads, but of a more reclined style. 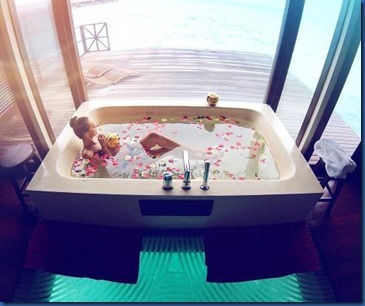 Its bathroom’s Jacuzzi bath has not one but 4 places to rest one’s head. 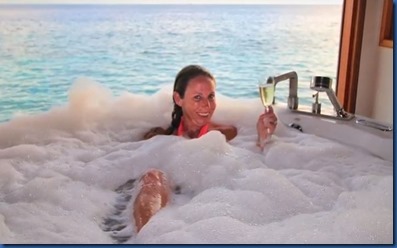 Head rests on bath tubs are a bit of a pet peeve of mine. 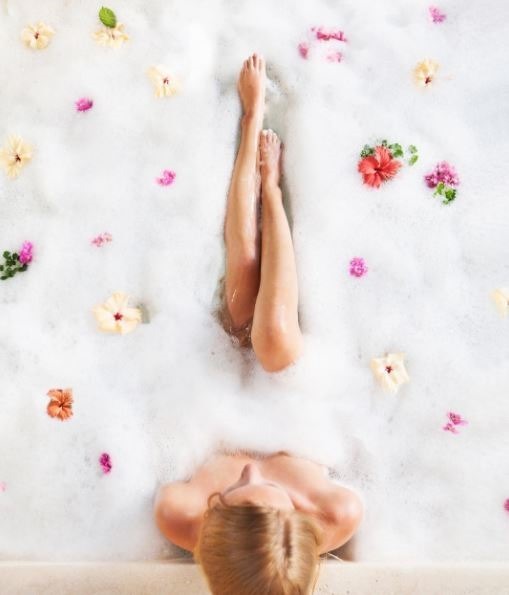 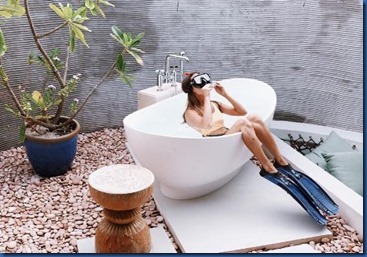 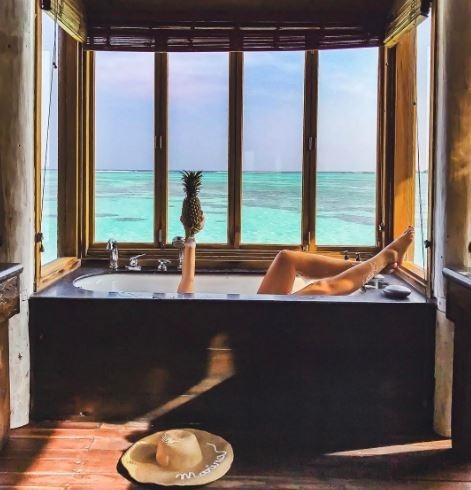 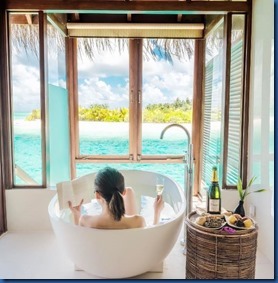 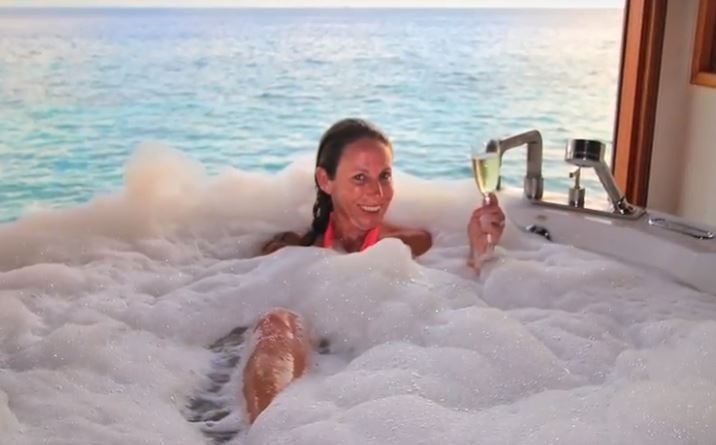 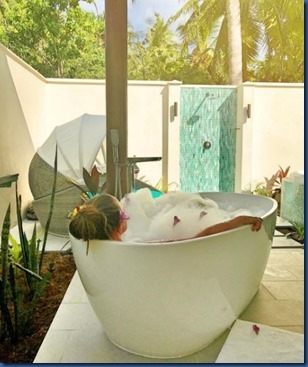 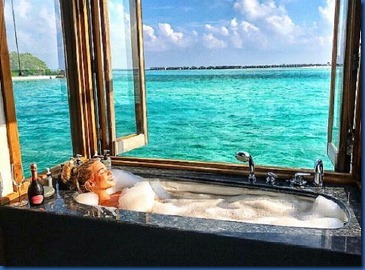 The Calgon-take-me-away moments are all about blissful floating and yet invariably your head is uncomfortably pushing on some ceramic-hard surface. 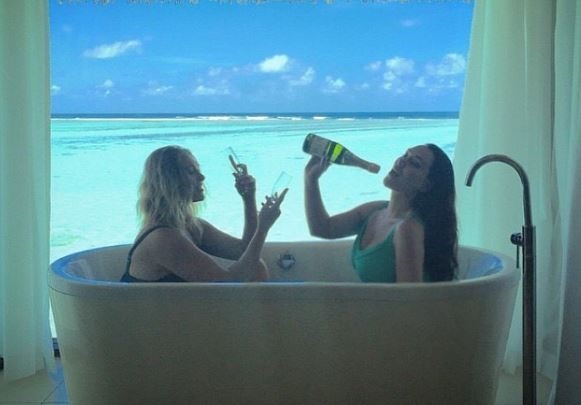 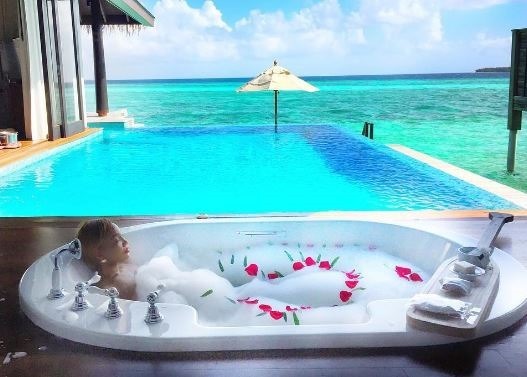 The latest celebrity Maldives visit (also in a ‘family way’) is Marvin and Rochelle Humes. No surprise that they too are staying at Reethi Rah. 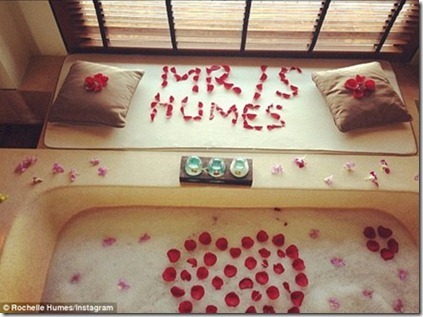 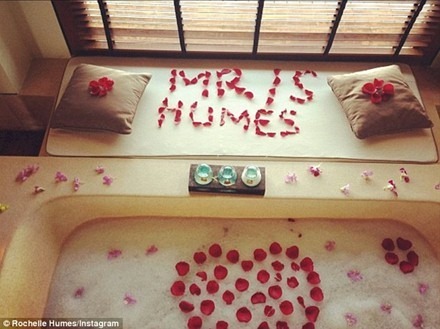 Daily Mail coverage included a pic of their bath decoration. 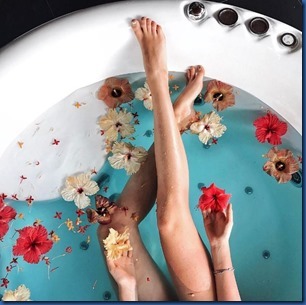 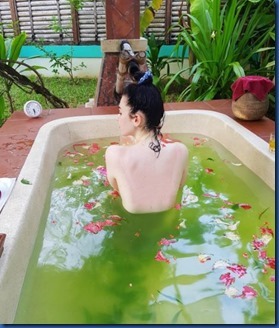 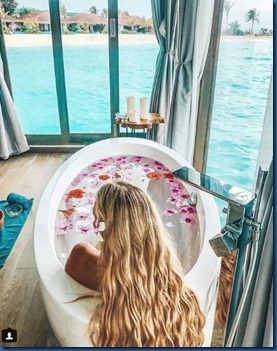 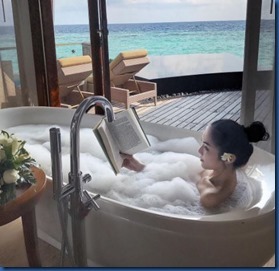 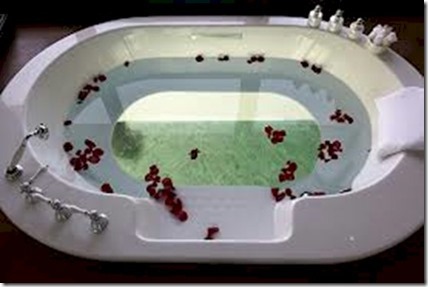 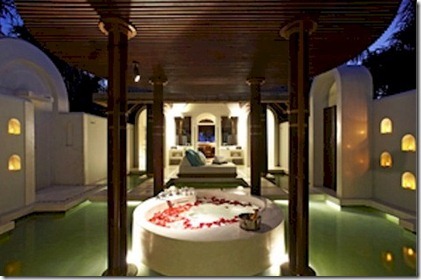 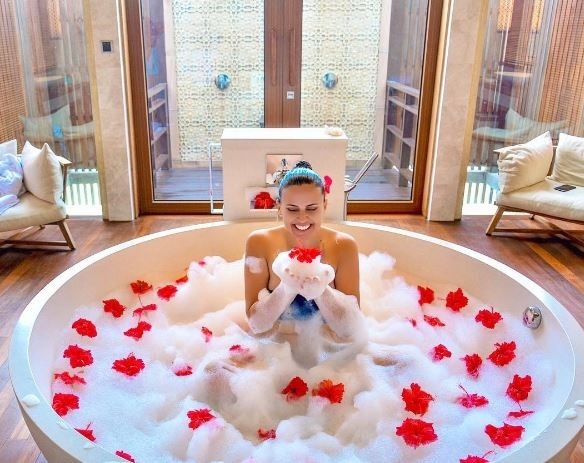 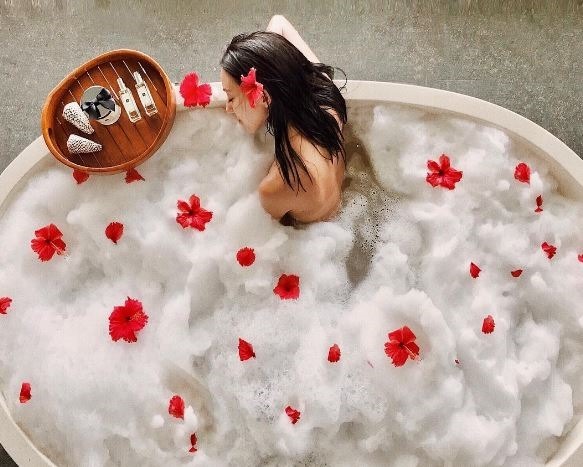 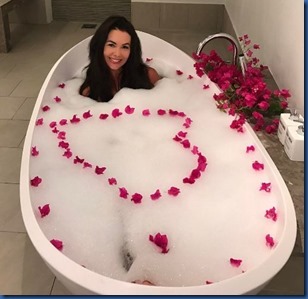 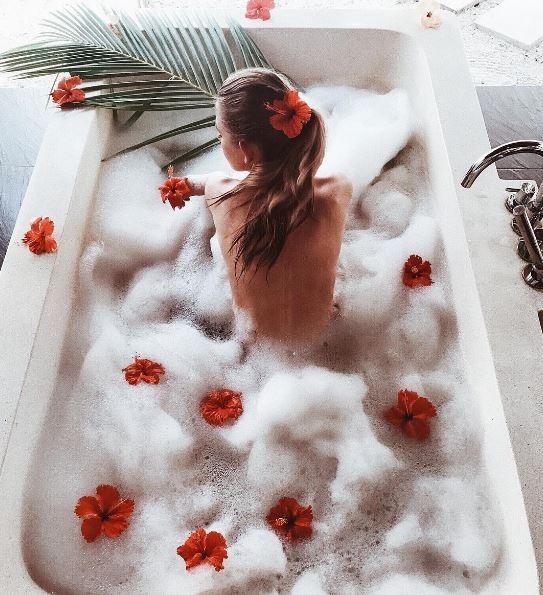 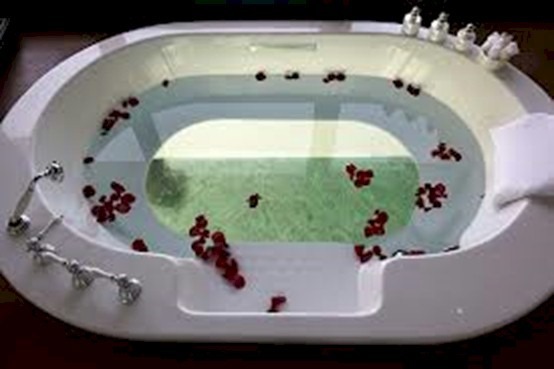 Petals in the bath water are de rigeur for romantic spa experiences, but Reethi has gone a step further applying this time honoured bed decoration to the other most relaxing (and at time romantic) part of a villa. 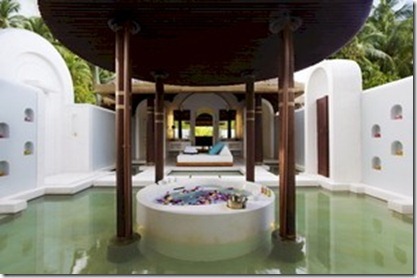 The aqueous surround bath experience goes even further with Anantara Kihavah’s bath pavilion. 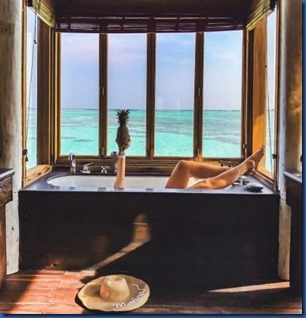 Sort of a temple to floating relaxation.